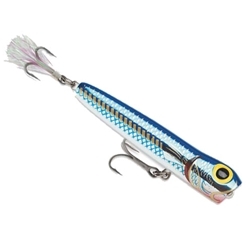 The Storm Rattlin' Saltwater Chug Bug is the do-everything topwater lure: Spits, Darts, Chugs and Walks-the-Dog! This TopWater features a Loud Rattle, #1 VMC Perma Steel Teaser Tail Hook, and has a weighted tail for long casts. This Chug Bug has a body length of 4-3/8" and weighs 15/16oz.